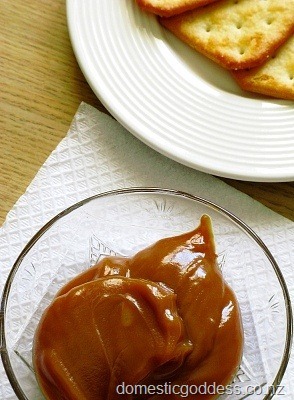 Dulce de leche is a sweet caramel which is popular in South America. Literally translated it means “candy of milk” and is prepared by slowly heating and stirring sweetened milk until much of the milk liquid evaporates and the mixture caramelizes. This can be a long process and we all have better things to do than stand at the stove stirring constantly for an hour or more. But there is an easier way, and you only need one ingredient – sweetened condensed milk. Actually, there is another ingredient. And that is time. But fear not, you do not have to stand for hours over a hot stove! You can get on with other things while the magic happens. As this is a slow process I tend to make a few cans at a time. That way, any that are not required immediately can just go back into the pantry until they are required. Or until they are discovered by marauding teenagers. It’s as easy as this. Place as many cans of sweetened condensed milk as will fit in the base of a large saucepan. Cover with hot water and bring to the boil, then reduce heat so the water is simmering slowly. Leave for 2.5 to 3 hours, checking regularly to ensure the cans remain completely covered with water as allowing the pot to boil dry could result in the cans overheating and exploding. This has not happened to me but I imagine it would not be a good thing! The length of time left simmering determines how runny the end product will be. For a runny caramel sauce, one and a half to two hours should be sufficient. For a very thick spread, up to 4 hours. When the desired time has elapsed, take the pot off the heat, carefully pour the water off, dry the cans and place them in secure storage away from marauding teenagers. It can be used anywhere a sweet caramel sauce is required. Warmed up and poured over ice cream, as the caramel in banoffie pie, as a filling in caramel muffins or just eaten off a spoon… apparently. Not that I would know anything about such behaviour! This stuff is amazing! I love it. I’ve been meaning to use it in millionaire’s shortbread for ages! oh, I remember this from when I was a kid…haven’t had it for years, but I love caramel!!! I follow yor blog and I love it! And It was so exciting when I saw you were doing a South American sweet! Im Brazilian and I eat that since I was little. To meke that delicious sweet faster, you can use a pressure cooker! But you can use one can at a time, taking off the lable and filling the pressure cooker by half with water, it cooks in 45 min. or till it gets pressure. I’m sure others can reap the benefit of that tip though. Thank you and happy cooking!